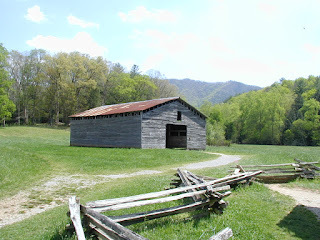 Cades Cove is a beautiful valley, or "cove", located within the Great Smoky Mountains National Park. When the park service took possession of the valley in the 1930's there were a considerable number of historic cabins still standing. The park service left many of these, while removing most of the newer buildings, leaving the appearance that the area is stuck in time. A view of the fields and mountains of Cades Cove. Photos taken on our visit of April 24-25, 2006. 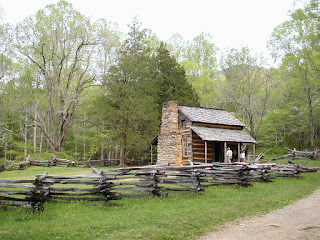 If you visit during late spring through mid fall be prepared for crowds and very limited parking. We had to skip several areas due to no parking spaces being available! 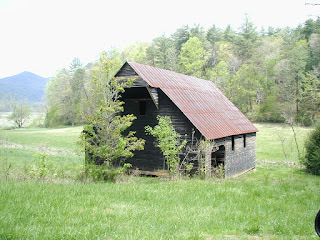 Cades cove has a superb collection of old barns of many styles. 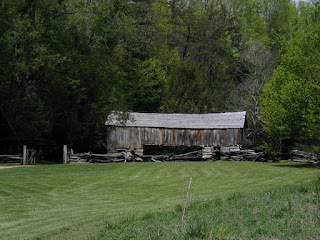 This barn looks somewhat like a covered bridge! This barn has a cantilevered equipment storage area on one side (no support columns to get in the way of equipment). 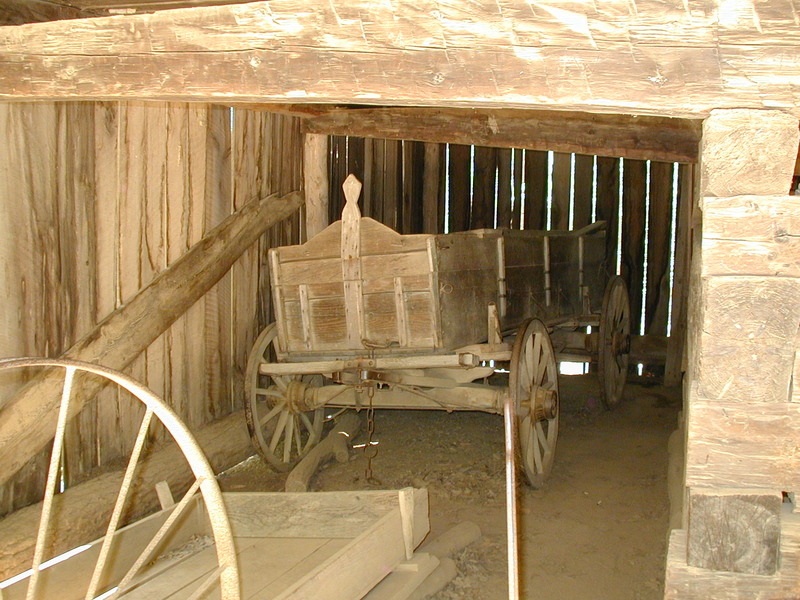 commonly used hauling sled, which was simply dragged over the ground. 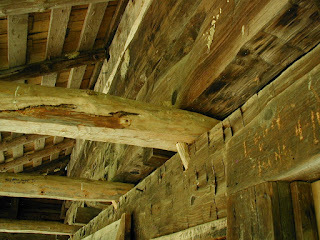 Somewhat typical interior structure of a barn. Hay and feed would be stored above with animals and equipment below. Another barn, this one a newer one built with milled lumber and a metal roof. 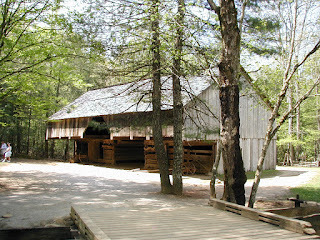 A wood bridge in Cades Cove. Cades Cove has a superb collection of pre-1900's settler's cabins. 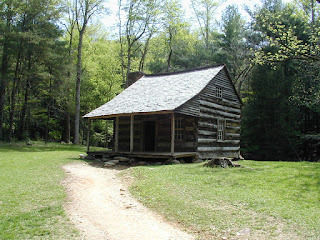 Fortunately, the later occupants of the area didn't tear down the old cabins, but continued to use them for various purposes. 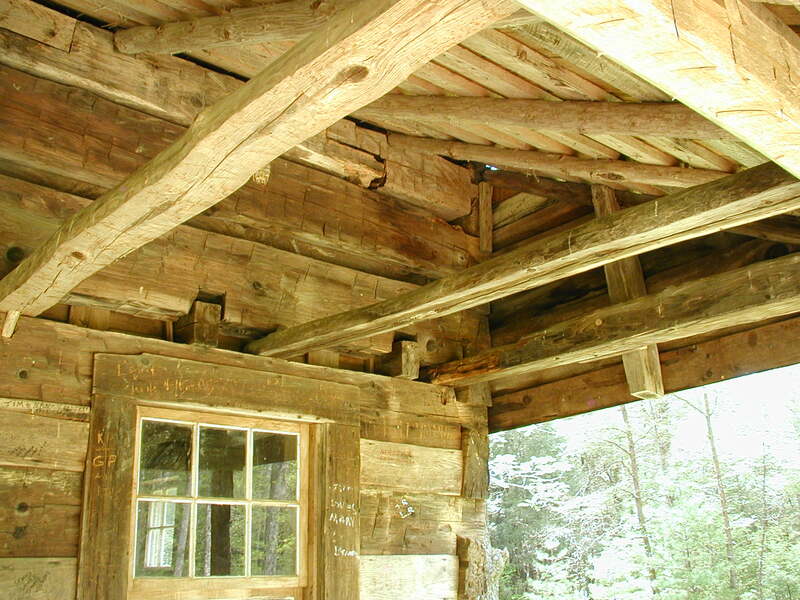 This left us with a great collection of historic structures when the area was purchased by the Park Service. 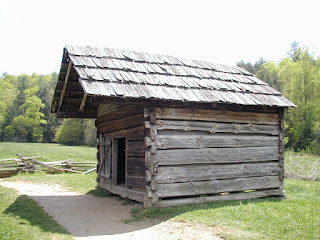 The average 1800's era cabin is about 18 feet by 20 feet in size and had a single fireplace for heat. 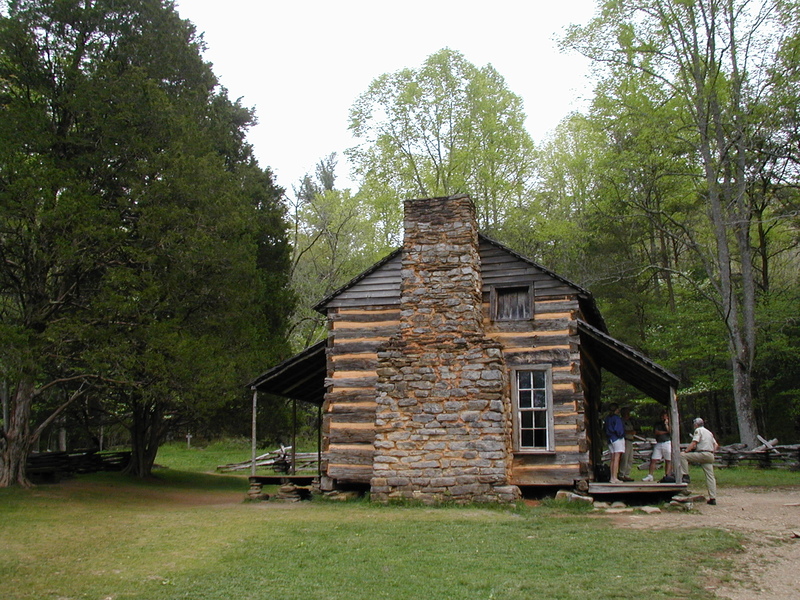 The logs typically were cut from Yellow Poplar trees, this tree tends to have straight, knot-free trunks which make good building logs. Floor boards tend to be White Oak, this rock hard wood holds up well to foot traffic. Many cabins have later additions, they are easily seen since they used saw mill produced wood rather than logs. Unfortunately, some of the more recent visitors have badly vandalized every one of them that is open to the public. Almost every inch of the interiors are completely covered with graffitti. One even had writing on the window glass! What a sad commentary on the lack of respect some people in this country have for our parks and historic resources. Why do these idiots think that anyone cares that they were there and felt the need to write on the walls to leave their mark on history? Do these jerks really think they are such important people? Due to their lack of respect for the other people in this world, I suspect the cabins will soon need to be closed to the public. That will ruin the great experience of being able to go into them and try to picture what life might have been like 150 years ago. 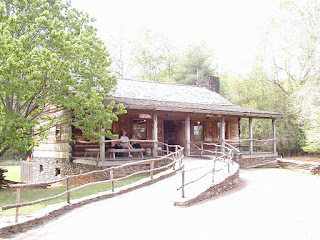 The John Oliver Place. A classic log cabin dating back to around 1820. 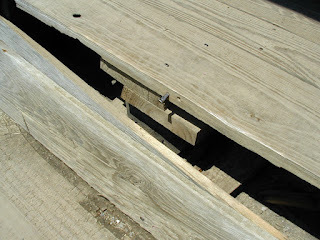 The logs are locked together using notches in the wood, mud was used to seal the gaps. 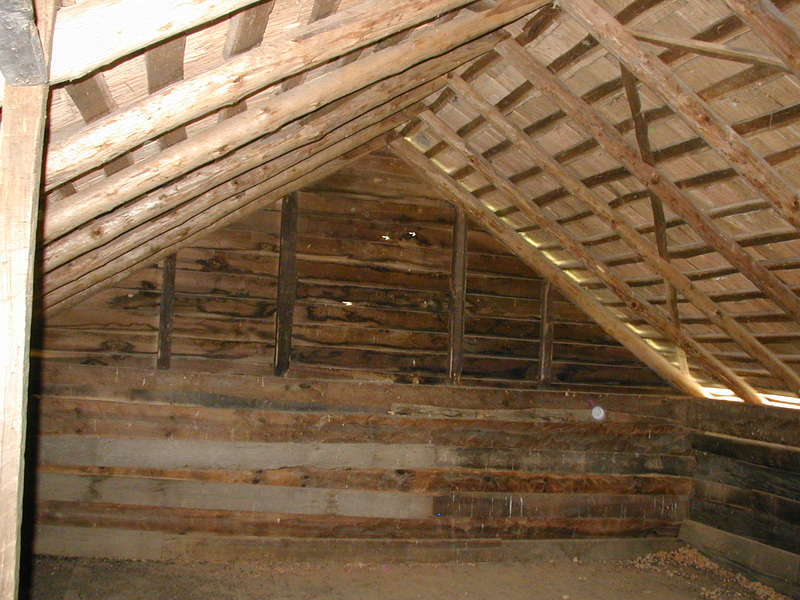 Inside is a single room, with a sleeping attic above. Families spent most of their time outdoors. Rock chimney on the John Oliver place. 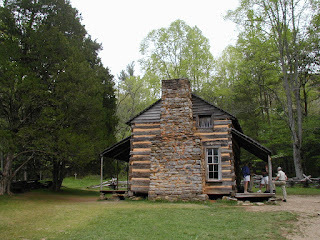 Note the dove-tailed corners on the logs. Also the stacked rocks supporting the back porch. 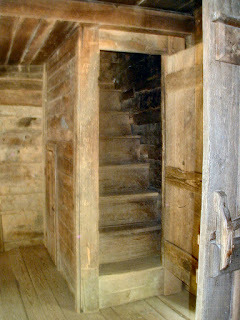 Stairs to the second floor/attic sleeping area. Note how steep the stairs are. The staircases were enclosed and had doors to keep the heat from escaping into the upstairs in winter. The upstairs sleeping area, typically just the sons slept upstairs. Nothing fancy here! No stove up here, cold in winter! 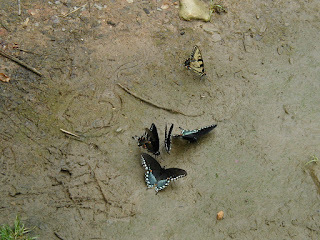 These butterflies were behind the cabin. 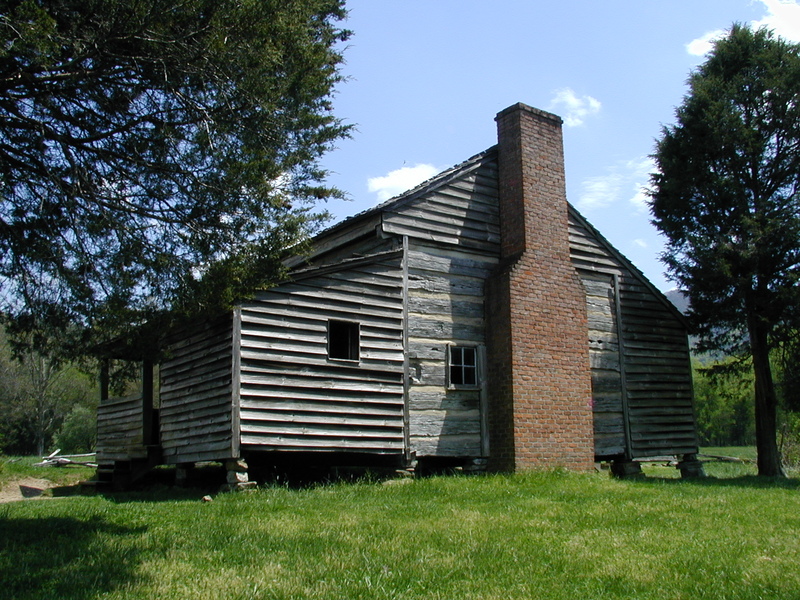 The Dan Lawson Place, 1856. 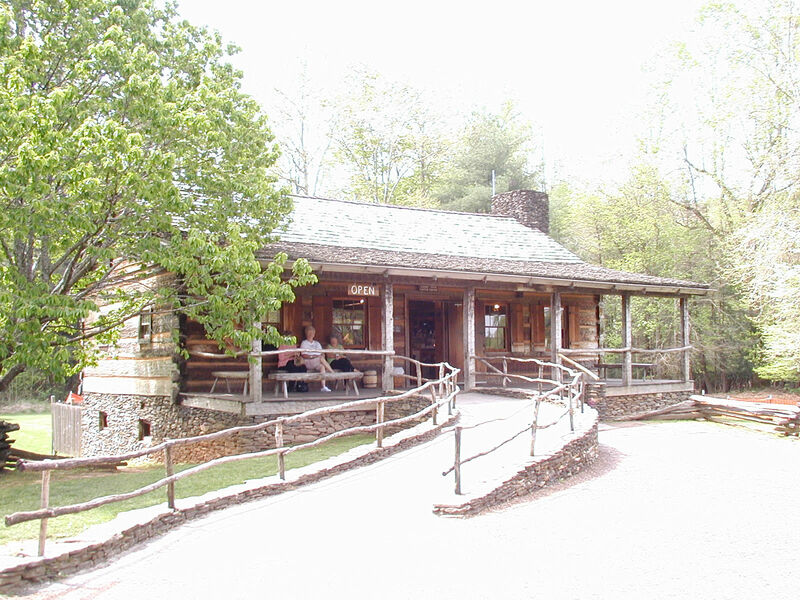 The Dan-Lawson place. 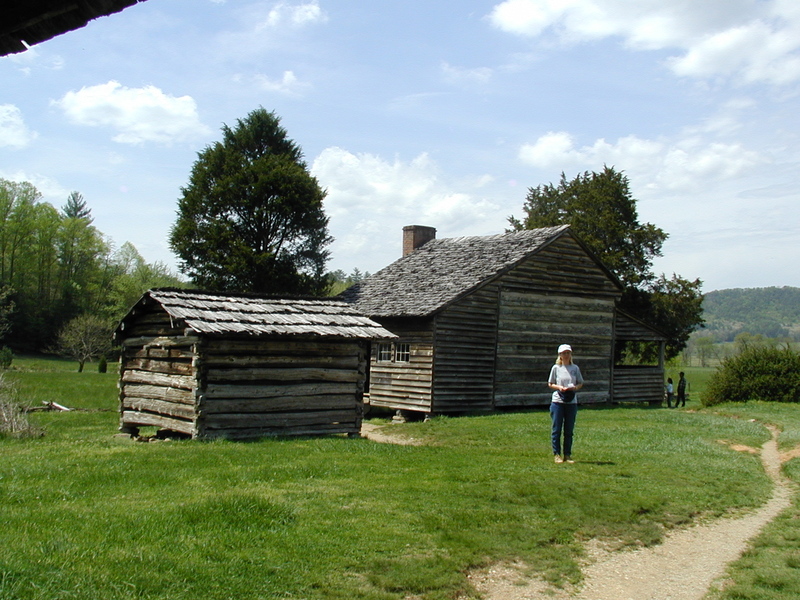 Notice the original log cabin side is apparent on the house, with later milled lumber porch and kitchen additions on either side. The building to the left is the Granary. A closer look at the side of the Dan Lawson home where the different additions over the years are more apparent. 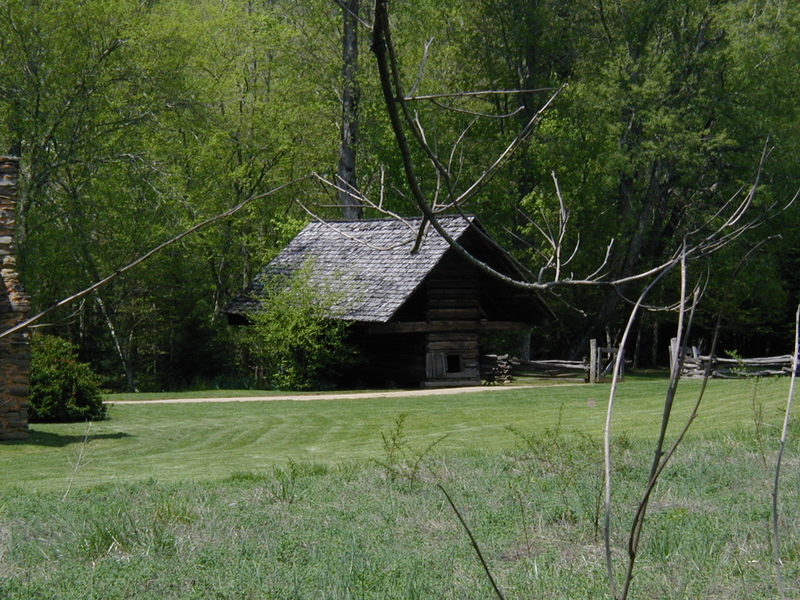 The original log cabin is in the center, later mill cut wood surround it. The brick chimney is a rarity, the bricks were home-made. The Dan Lawson barn, built with milled lumber. 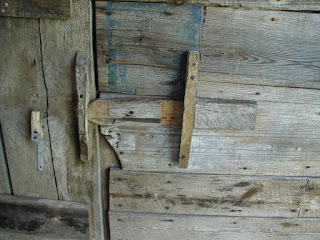 Barn door latch detail at the Dan-Lawson place. 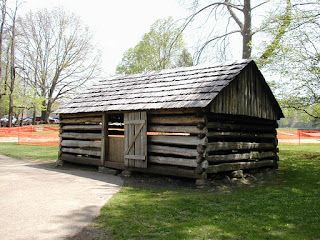 The smokehouse/meathouse at the Dan Lawson place. Local Red Maple would probably be used for smoking the meat. The meat would most likely be ham and salt would be used as the primary preservative. 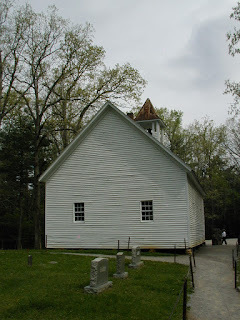 The granary at the Dan Lawson place. You need to look close, but there is a square nail partially protruding from the wood floor plank where a board broke off. Probably a reproduction of a square nail, a bit shiny to be decades old. 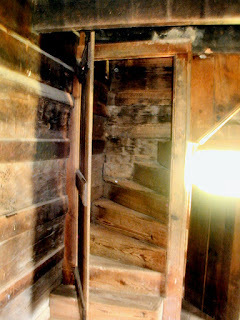 The staircase to the second floor sleeping room inside the Dan Lawson home. This was a fancy turning stair design that uses less floor space in the small house. 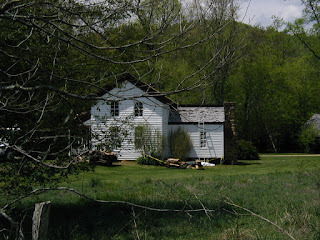 vegetation would have been kept well away from the house. This helped keep insects and snakes out of the house. 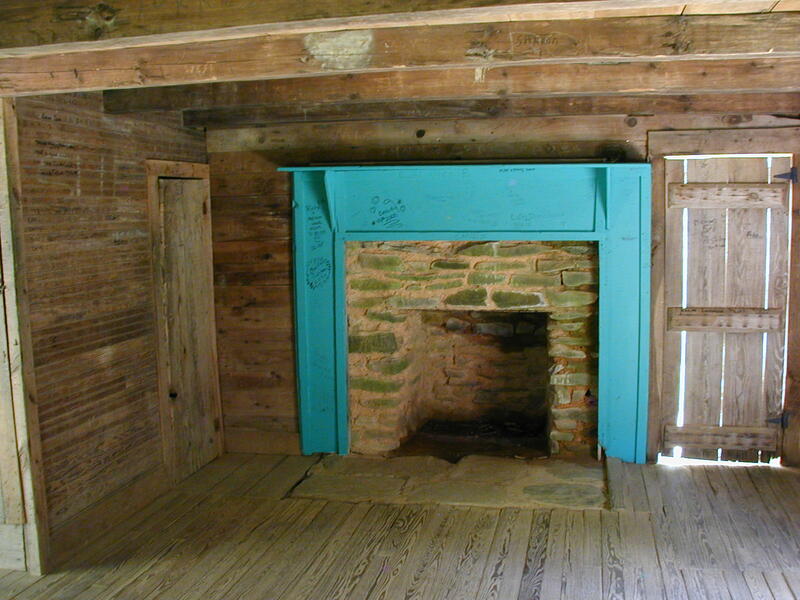 Interior and fireplace of the Carter-Shields Cabin. Not sure if the blue paint is an original color. Anything painted is rare on these older buildings. 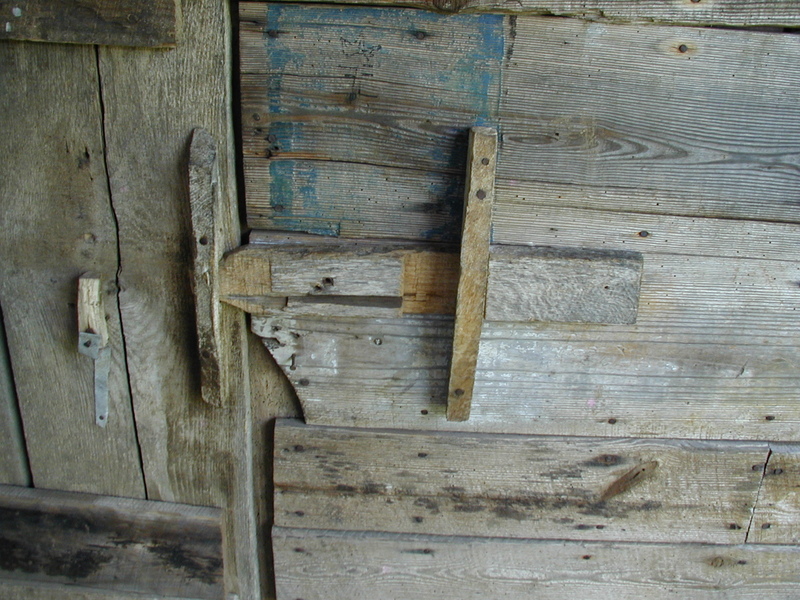 Detail view of the wood peg system used to hold the ceiling joists to the outside wall. Also note the hatchet marks on the larger logs. Another look at the construction detail of the Carter-Shields Cabin. 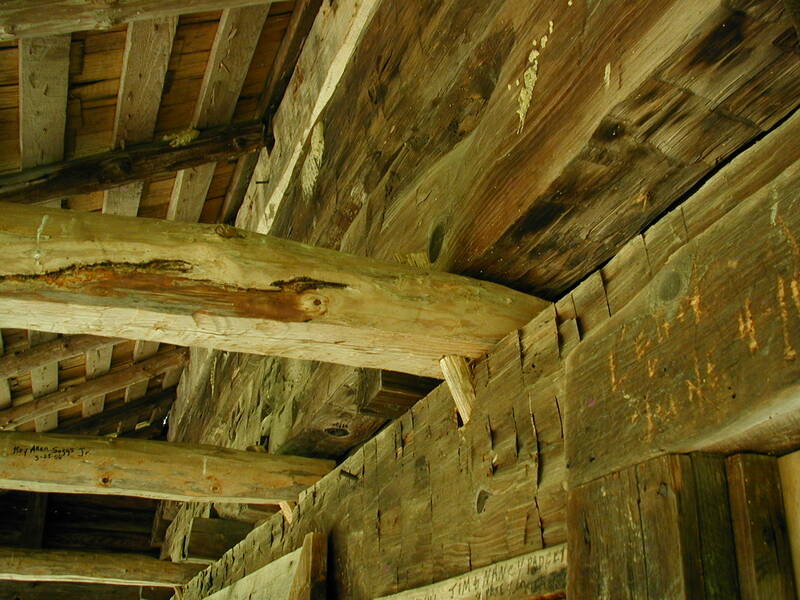 Notice the uneven edges of the beams where they were split with a hatchet or wedge rather than cut with a saw. In the past the Park Service leased out the farmland in Cades Cove to local farmers who grew crops on it. This kept it from reverting to forest. However the current emphasis in large parks like the Great Smoky Mountains is on eliminating non-native species from the park. 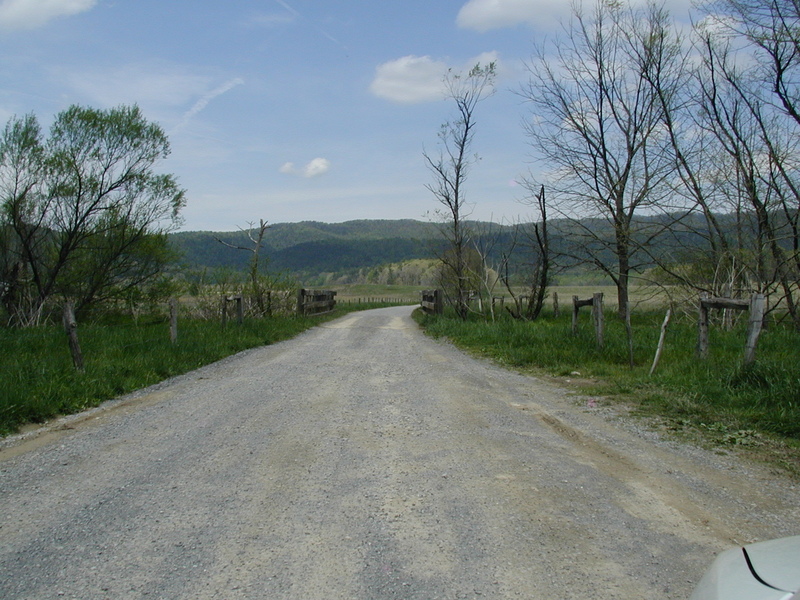 Since Cades Cove is well within the park rather than near the edge it created a problem, seeds from the non-native crops were spreading into the surrounding forest areas. So they no longer grow crops in the Cove, but this creates yet another problem. 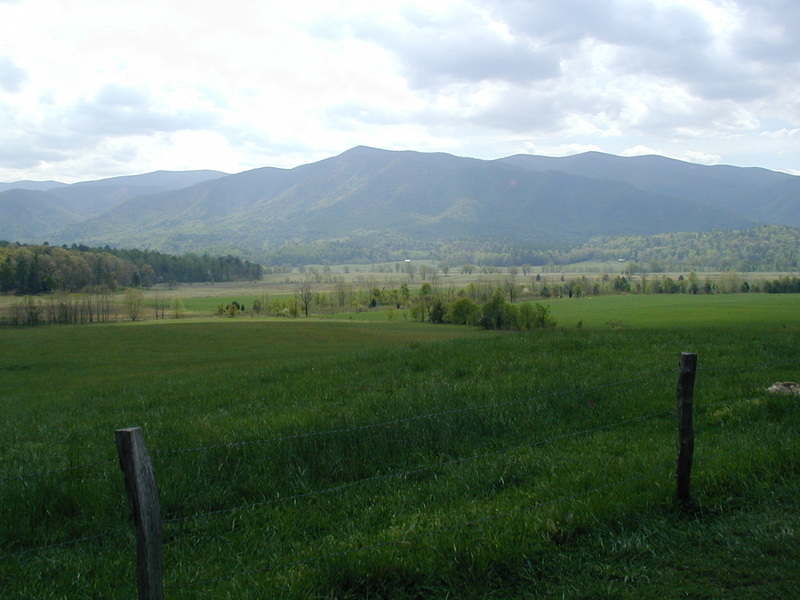 The Cades Cove area is maintained as a historic, rather than natural area, thus the goal for this small cove is to keep it looking somewhat like farmland. 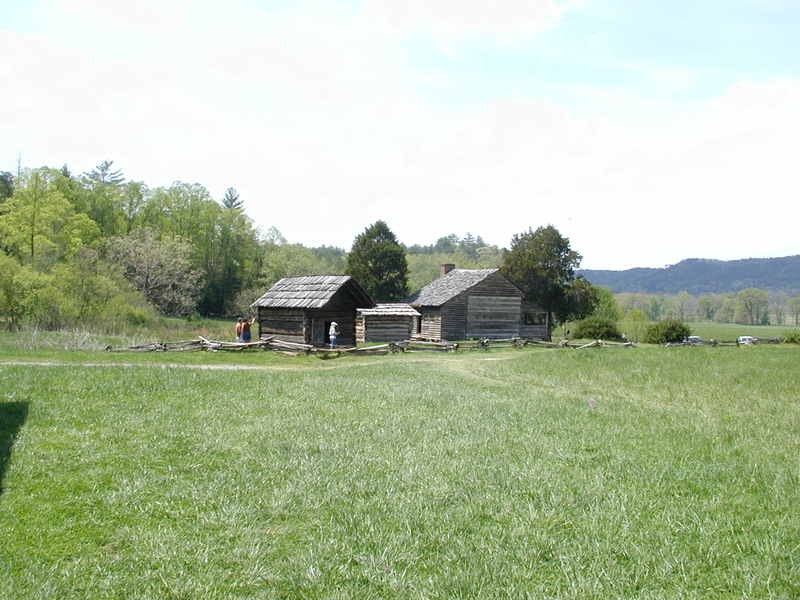 At the time the park service purchased the land, the farmers had cleared just about everything in the cove that was level enough to farm, and such a large area was not needed to convey the historic feel. So much of the perimeter areas have been allowed to revert to forest. 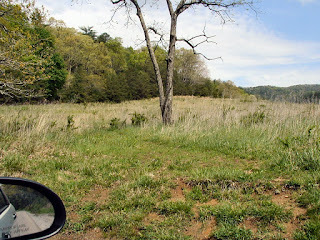 To keep the rest of the area from reverting to forest the Park Service burns the fields every few years. Burning is usefull as it kills many of the non-native plants and seeds. But burning also creates it's own environmental problems, such as smoke, so they are experimenting with other methods such as herbicides and mowing the fields to keep them from becoming forest. At the same time they are trying to reintroduce native grasses and eliminate the imported European grasses brought in by early settlers. 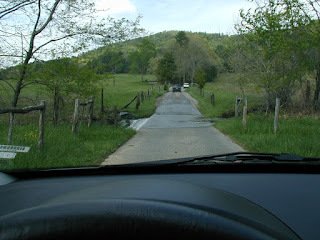 If you have read many of my park visit pages, you know that I sometimes give the park service a bad time for what I think are bad design or management decisions. Managing a national park is a difficult task. Everything they do tends to have both positive and negative impacts. Even when they think they have a great solution to a problem, someone, someplace, will have heartburn over it. From the top management down to the ranger trying to settle a disagreement between a couple of park visitors, its a harder job than it may at first appear. You and I may not agree with all of their decisions, but they do the best they can in a difficult situation. So next time you see a park ranger, give them a bit of respect. A stream crossing on the single lane road that loops around the cove. There are many old churches in Cades Cove, I've included three here, representing different views of what a church building should be. 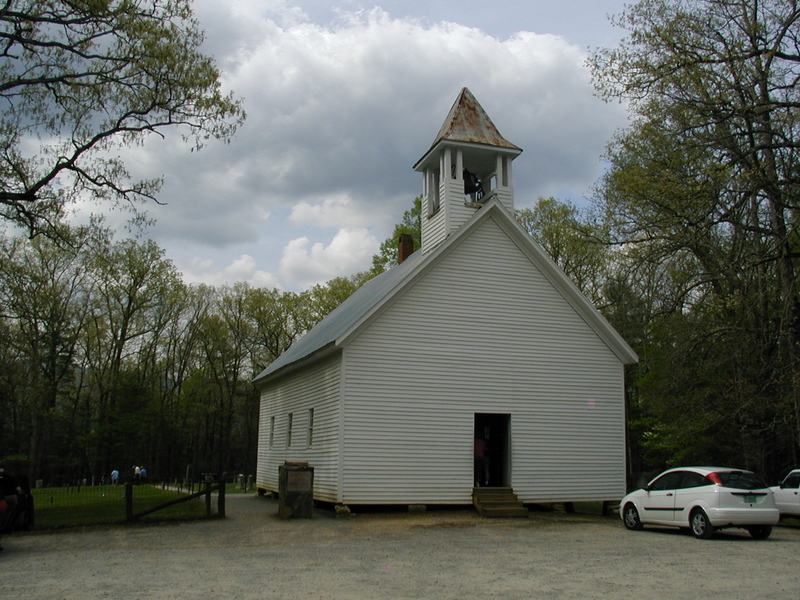 This one is the Primitive Baptist Church, built in 1887. 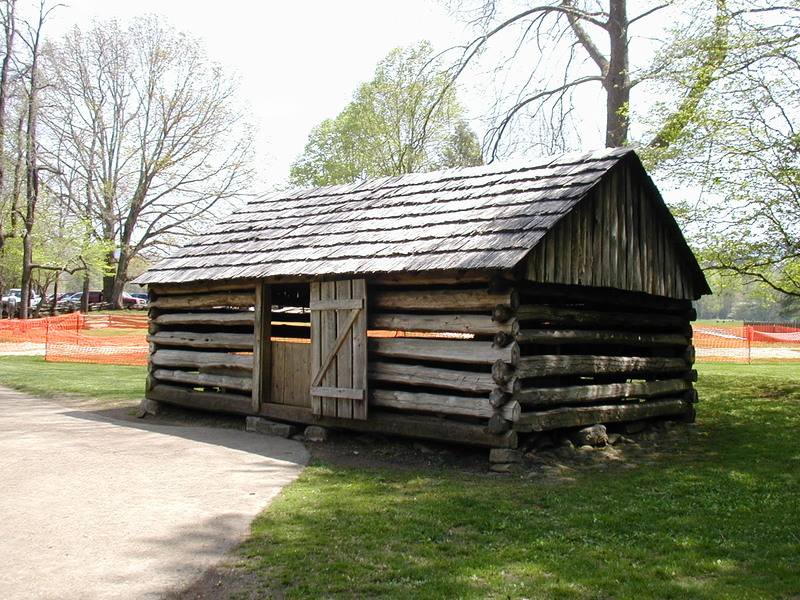 A very basic structure, one room, no ornamentation other than the bell tower. 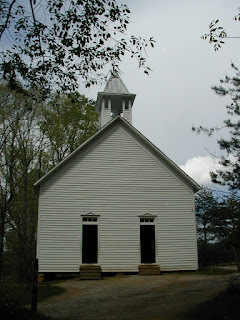 The interior of the Primitive Baptist Church. 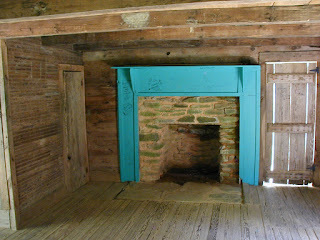 Note the metal plates on the floor and ceilings where the stove was in the middle of the room to best distribute heat. Beyond that there is little to distract the worshipers. 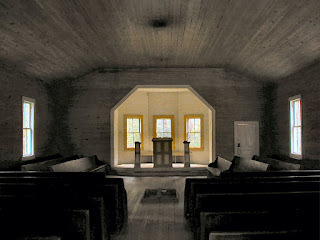 The pews are basic and simple in construction, as is the rostrum. 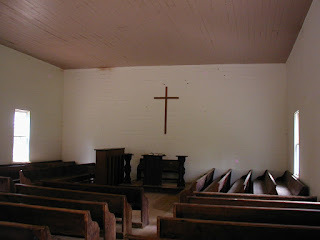 The books on the rostrum are Bibles left by park visitors. Most of the Bibles have comments or dedications inside the front cover. The rear of the Primitive Baptist Church, viewed from the cemetery. 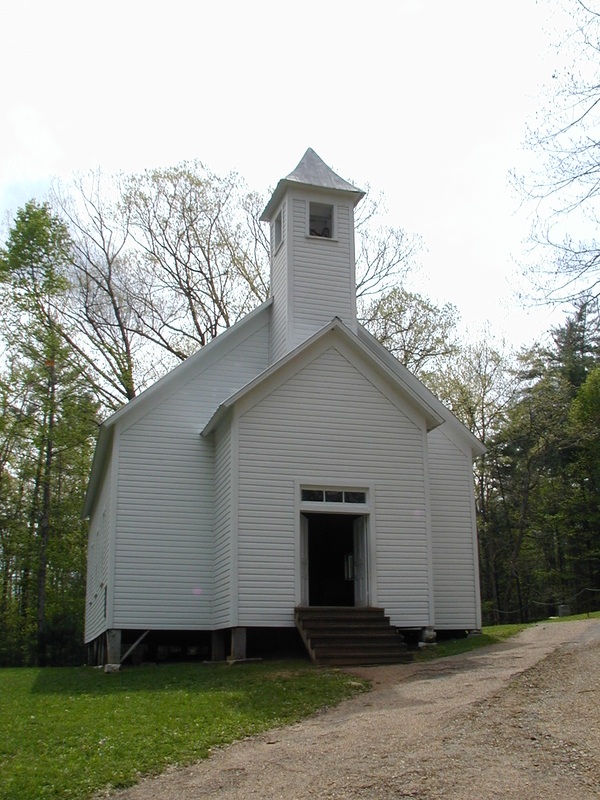 This is the Methodist Church, built in 1902. 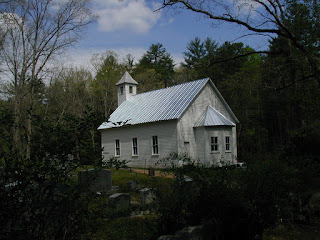 Much fancier than the Primitive Baptist church. Note the transom windows above the doors. Unlike many churches of the time, the Methodists did not separate the congregation (audience) by gender. So why the two doors, typically one for men the other for women? 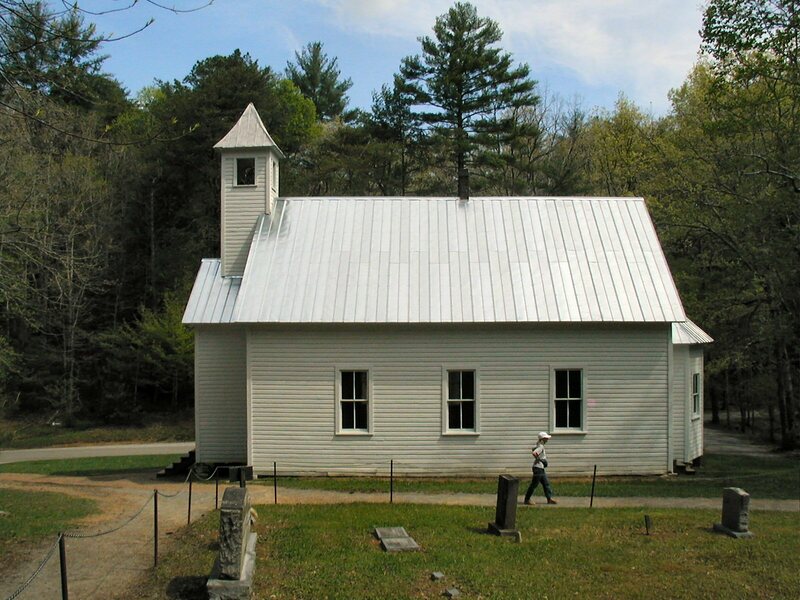 This church was built from a set of standardized plans, and the plans called for two doors. 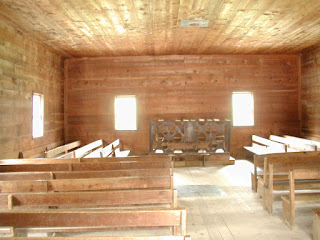 Interior of the Methodist Church. Note the nicer pews and larger windows. There are two rostrums for lay-readers (non-clergy) as well as a pulpit for the preacher on the left. Side view of the Methodist Church from the church cemetery. 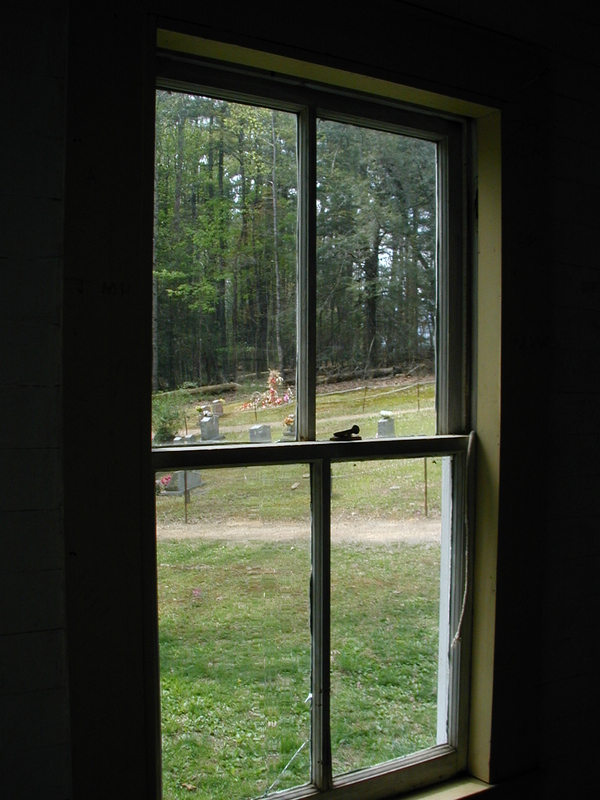 Notice the fancy trim over the windows. but it is also the newest. The Missionary Baptist Church has both a narthex (the entry-room under the bell-tower), and a alcove on the other end. 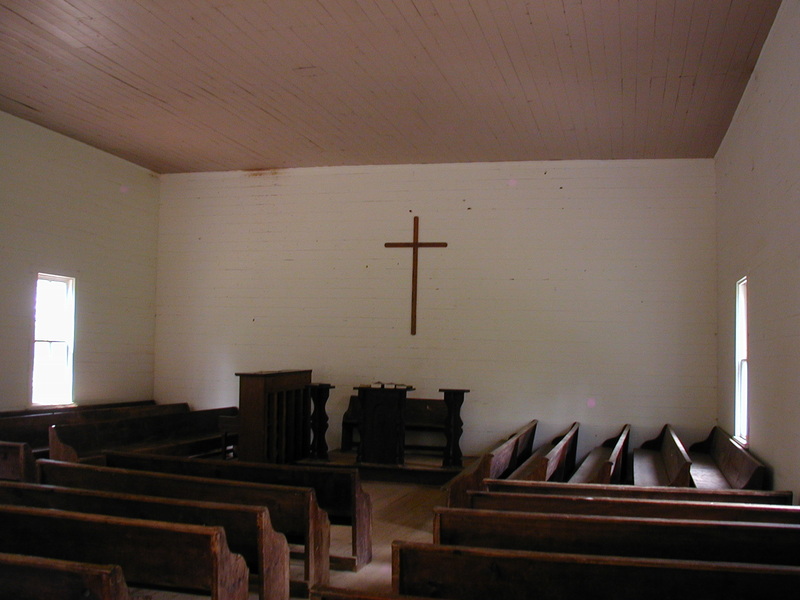 The interior of the Missionary Baptist Church. 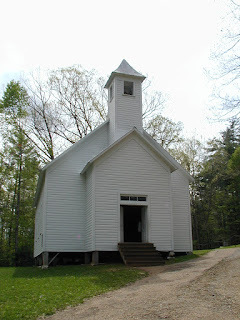 Note the alcove behind the altar. 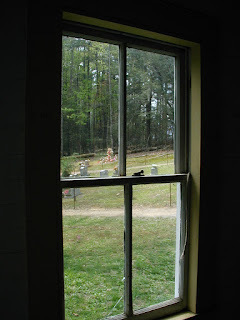 Looking out the window at the cemetery of the Missionary Baptist Church. 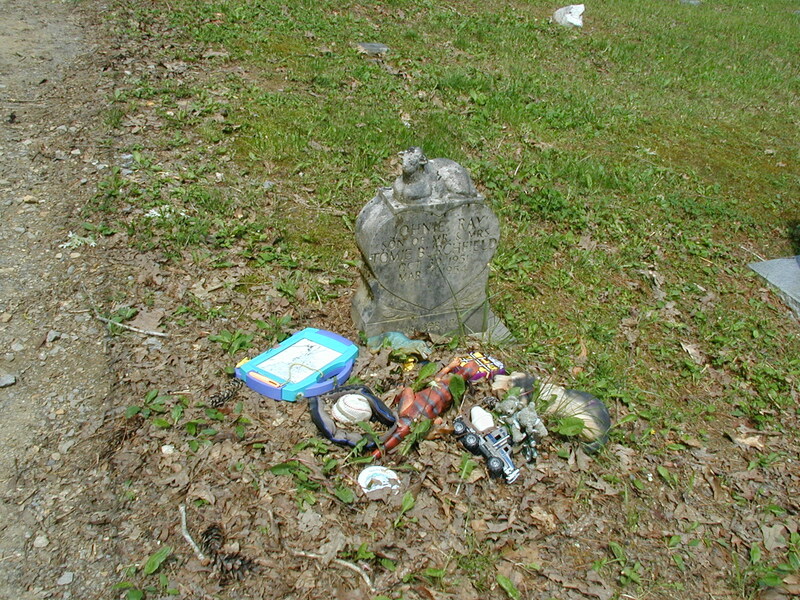 A young child's grave in the cemetery. 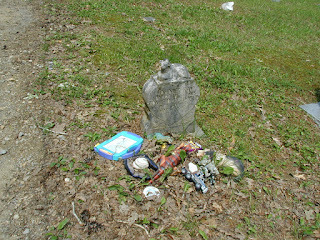 In a rather touching display of sympathy, children visiting the park often leave one of their own toys by the headstone. 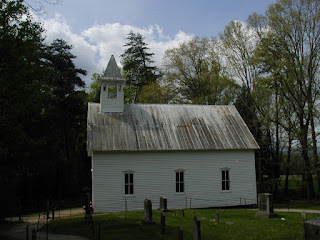 Another view of the Missionary Baptist Church. The Cades Cove Visitor Center at the Cable Mill Historic Area. This is an area where the park service has relocated several buildings to in order to recreate some typical scenes from a 1800's era farm Cades Cove farm. The following photos are all from the Cable Mill Historic Area. This larger 1879 home is located in the Cable Mill area. It is fully furnished inside. Unfortunately it was closed as they were replacing the roof. 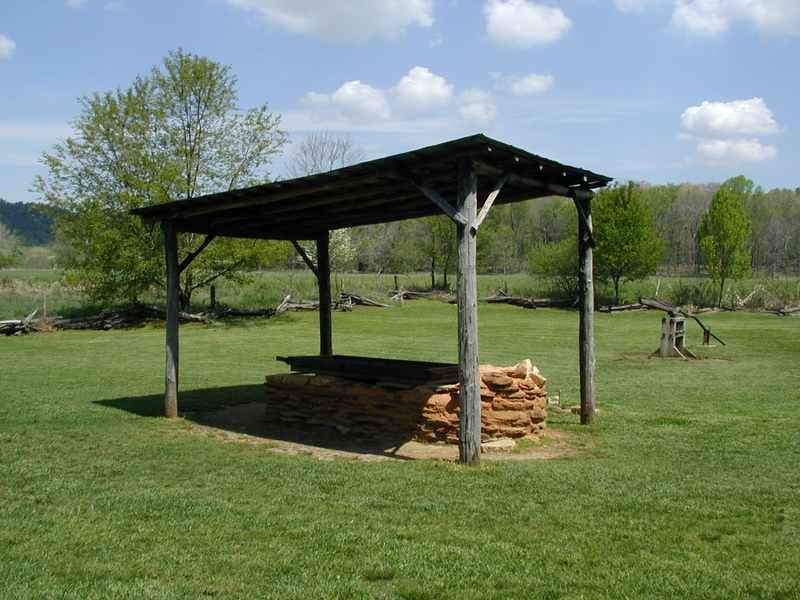 This is a smokehouse, where meat was cured and stored. 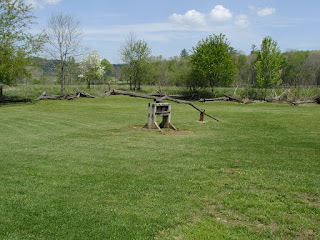 This device is a sorghum press. The wood arm is attached to a horse or mule, the animal walks in a circle around the machine pulling the arm. 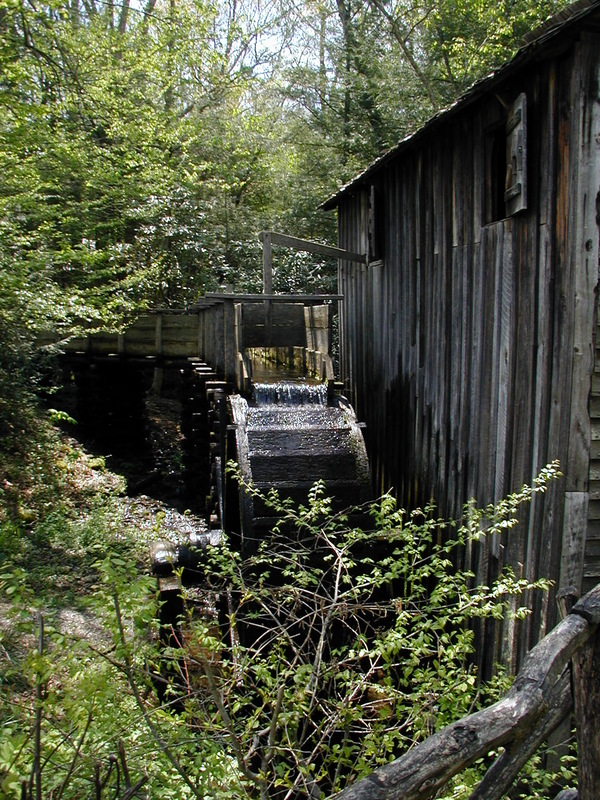 The arm is attached to a pair of large gears, which turn as the arm rotates. The cane of the sorghum plant is fed between the large gears, which crush the cane. 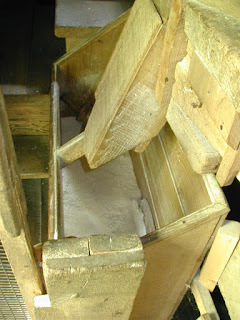 As it was crushed the sugary sap is squeezed out of the cane and drips down into a bucket which is placed in the hollow opening under the press. 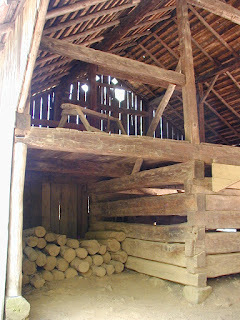 After being crushed the cane was used as animal feed. This is the sorghum furnace. Sorghum juice collected from the sorghum press (photo above) was placed in pans or kettles and boiled over a fire to reduce the water content and make "Sweet Sorghum" (sorghum molasses). 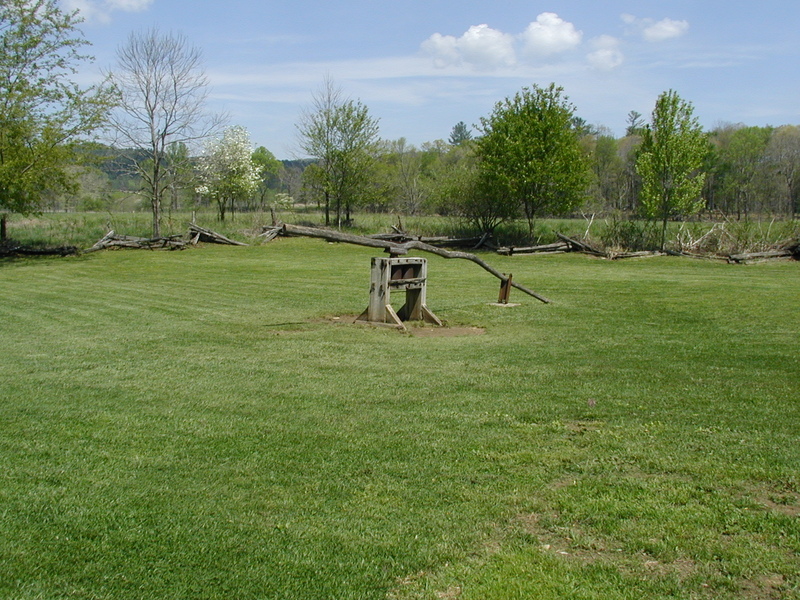 About 10 gallons of sorghum juice is needed to make a gallon of molasses. 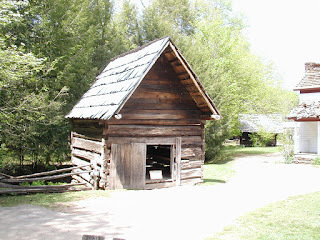 A fully-operational replica of a late 1800's blacksmith shop. Periodically the park service gives blacksmith demonstrations here. 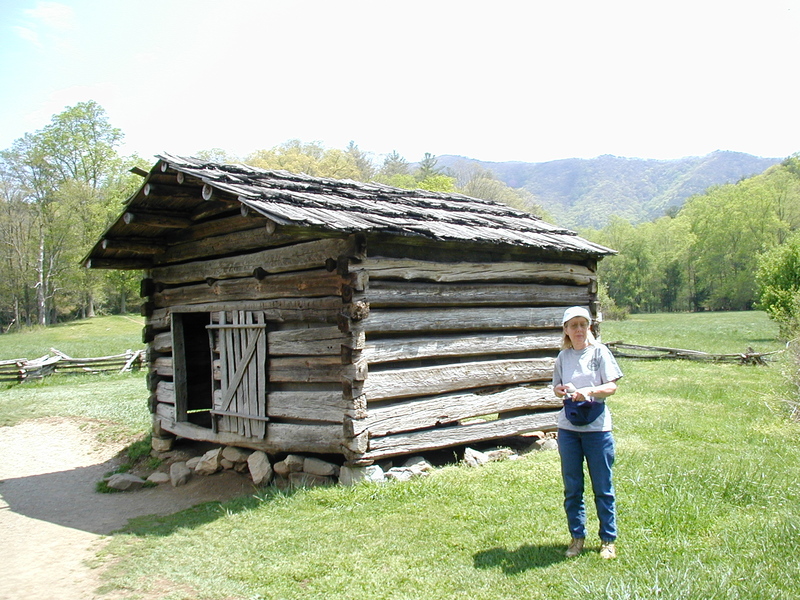 A large corn crib at the Cable Mill Historic area in Cades Cove. (or other products) daily during the spring, summer and fall tourist season. 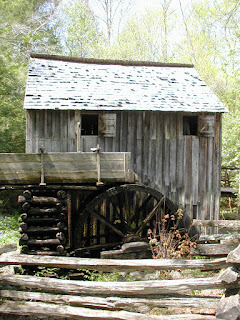 The meal from the mill may be purchased. 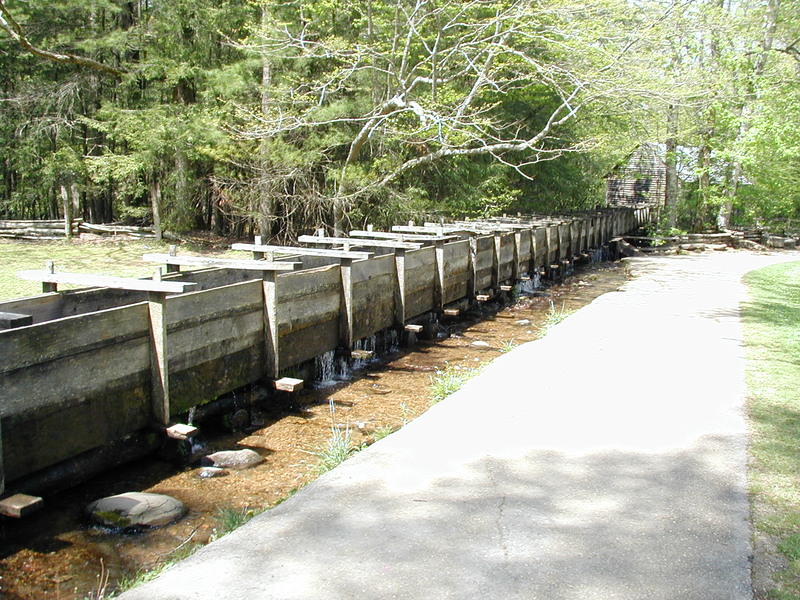 This is the wood flume that feeds water to the Cable Mill grist mill. 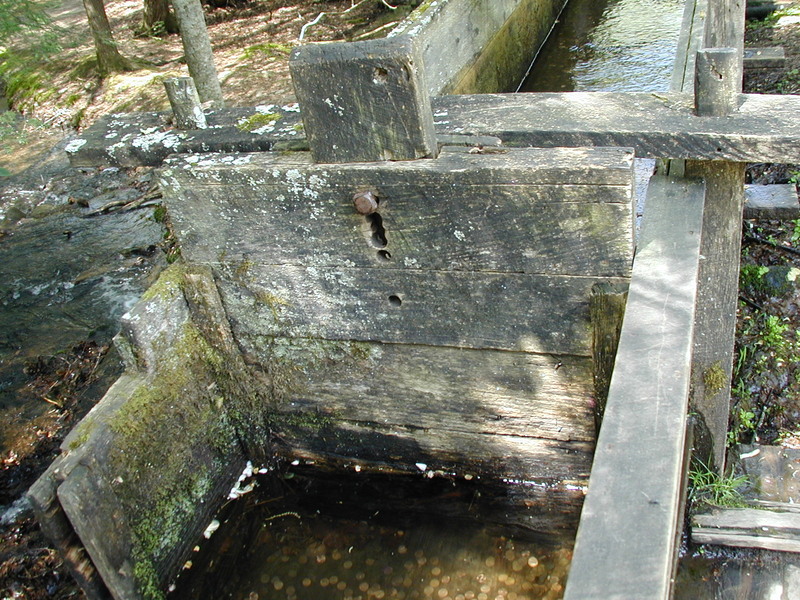 A wood gate in the flume controls the amount of water that goes to the water wheel. 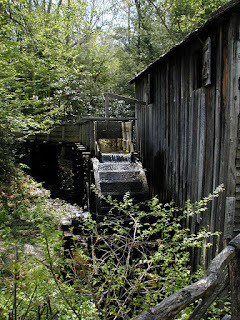 This is used to control the speed of the mill, more water makes the mill wheels turn faster. 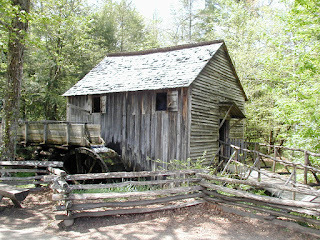 Different view angle of the Cable Mill. 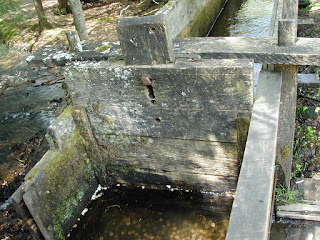 Close up view of the Cable Mill's water wheel. 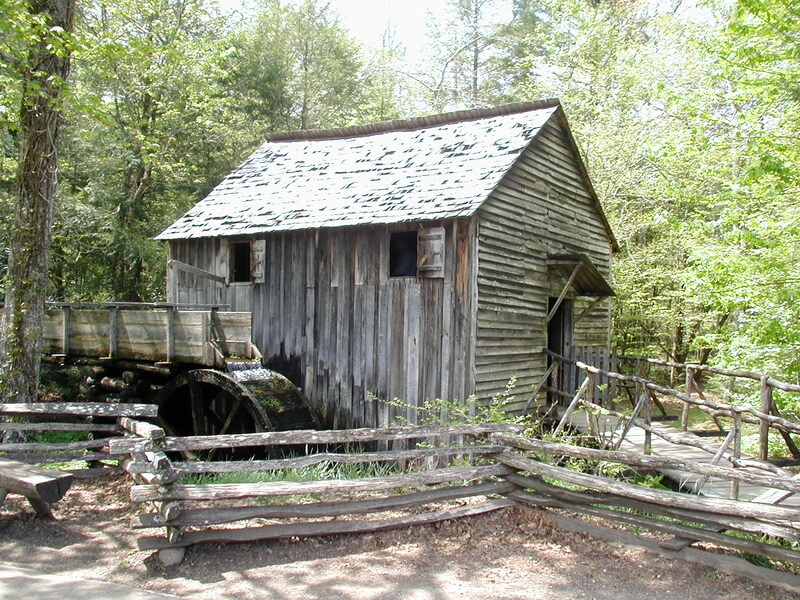 Inside the Mill Building is the actual mill equipment. 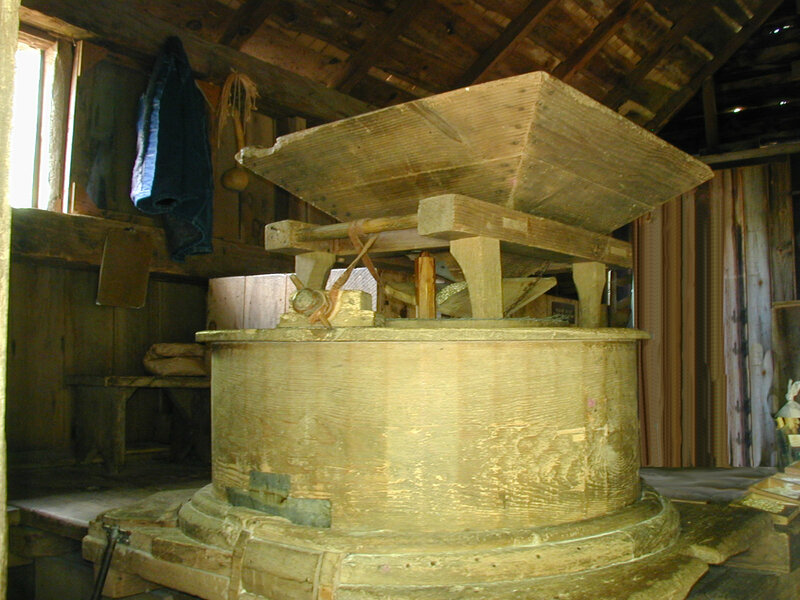 Dried corn kernels are poured into the funnel shaped hopper at the top, which feeds them slowly down to the mill wheel in the round enclosure below it whee the kernels are ground by the stone wheels into flour. 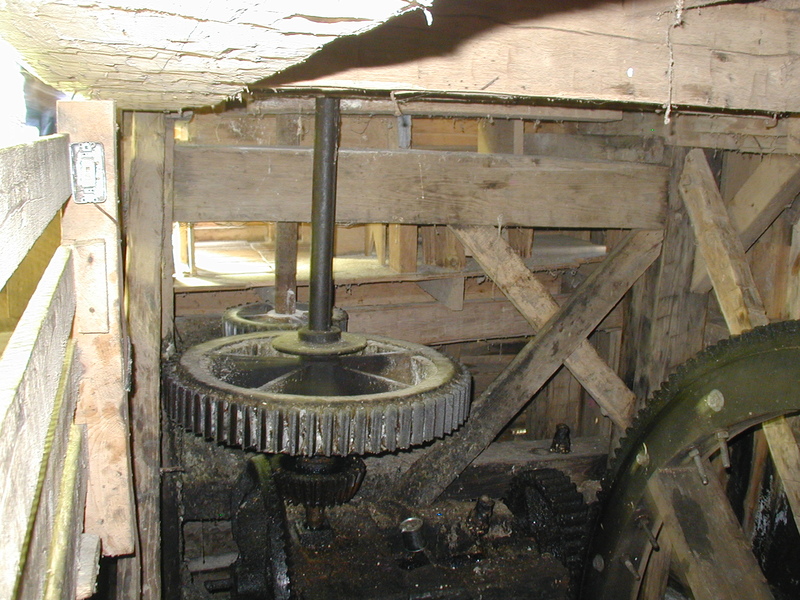 Gears inside the mill that transfer power from the water wheel outside to the grinding wheel above. These gears are steel, however the original gears likely were made from the wood of Dogwood trees! from where it is collected and bagged. Buy some at the visitor's center! Continue to Next Page: Free Stock Photos of Historic Mountain Farm. Mountain Farm on the North Carolina side of the Park is a fun collection of historic buildings and equipment moved there from throughout the park to create a small operating historic farm you can explore. Lots more free photos for you to use!